Grammar - more than a set of definitions! Our grammar Clue Cards from The Big Bad Grammar Slammer will give you a visual diagram of the major grammar terms. Guess what? The study of grammar is more than a list of grammar definitions. Grammar is the relationship between the parts of speech. Using words correctly allows you to write and punctuate any sentence. 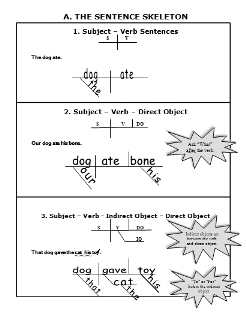 See below for the grammar Clue Cards download. I saw John. He is leaving tomorrow. In this sentence, "John" is the antecedent. Shannon, my cousin, is coming. Articles - "a", "an", or "the"
See dependent clause and independent clause below. Although she is forty, she looks like she is only thirty. Dependent clause - A clause contains a subject and verb but cannot stand as a complete sentence. Infinitive - A noun phrase comprised of "to and a verb"
To smoke is to risk your health. is, was, will be, etc. Running in the sun, the athlete became tired and thirsty. Predicate Nominative - A noun in the predicate that is the same thing or person as the noun in the subject. Now, don't you feel smarter after reading all those grammar definitions? Actually, I highly recommend downloading the Grammar Slammer Cue Cards so you can visually see how all these interesting grammar definitions actually work. It isn't enough just to know the common grammar definitions. Writers who master these concept of the parts of speech can define and sharpen their tools when they are discussing them. Yes, it is possible for someone to use exciting verbs without knowing the definition of "verb." However, it would be difficult for an editor or a teacher to explain to a writer that they need more action verbs, if they were unfamiliar with the concept of "verbs." Those five different parts of speech are demonstrated in this sentence: The sharp knife smoothly sliced through the rope. Are you looking for more than simple grammar definitions? Our English Grammar Tutorial provides an overview of grammar lessons and concepts. Click the image to find the FREE Clue Cards download. You'll discover how practical and easy grammar and diagramming can be for students and young writers. Or, you can order the entire curriculum below. Looking For An Easy English Grammar Tutorial? 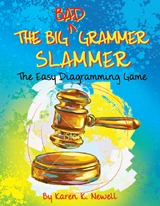 The Big Bad Grammar Slammer is a fun and simple review of all the major grammar definitions and uses of parts of speech. Better yet, it will make your proficient at writing and punctuating complex and compound sentences with confidence. Non-consumable, 5th to 12th grade. The 3 Ring Binder is great for durability. Put the Clue Cards in page protectors and you can use them over and over for years. Many families like this economical, soft bound version. The paperback cover makes the book easy to use and store on your shelf. You may download the e-book from your computer. No shipping fees. No waiting.